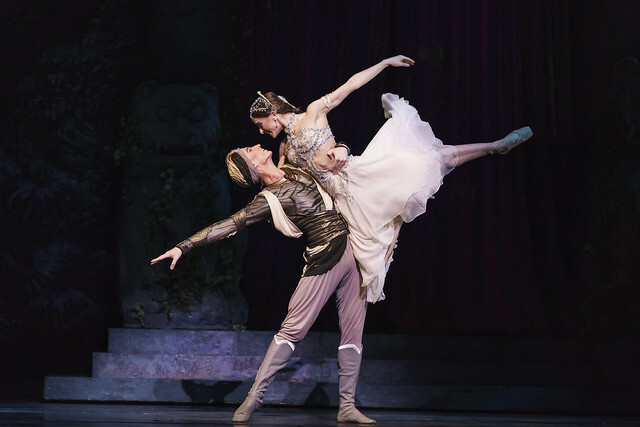 Your Reaction: What did you think of La Bayadère live in cinemas? The audience respond to The Royal Ballet's production of Natalia Makarova's production of this 19th-century classic ballet, live in cinemas across the world. spectacular production of #ROHbayadere. Magnificent performances by @MNunezOfficial and Vadim Muntagirov . Loving every moment. Watching from El Puerto de Santa Maria, Spain. #ROHbayadere Amazingly beautiful story telling and stunning performances. Perfect! #ROHbayadere a mystical, moving magic carpet ride of emotion. @MNunezOfficial is magnificent! #ROHbayadere. Here in Cuneo (Italy) we are astonished. The three protagonists look immaterial. And The Kingdom of Shades: OMG! #ROHbayadere Awesome. What a production. From the costumes to the sets to the lighting to the dancers to the orchestra everything was perfect. #ROHbayadere OMG absolutely stunning what a feast for the eyes greetings from Gibraltar ??????? ?, loving a every second of it! #ROHbayadere absolutely stunning ballet, Amazing dancers. Love from Pisa. What did you think of La Bayadère live in cinemas? This production is staged with generous philanthropic support from Mrs Aline Foriel-Destezet, Julia and Hans Rausing, Simon and Virginia Robertson, John and Susan Burns and The Tsukanov Family Foundation. Beautiful production. Amazing ballet. The Kingdom of Shades: mesmerizing...! Thank you all for such a terrific performance! Love from Bilbao. THE most out of this world, beautiful ballet experience for myself. My daughter’s very first experience of seeing a ballet production( instead of being a dancer). It was a very precious shared experience.Thank you to the awesome dancers and to everyone involved in bringing this magical work of art to life!!! So emotional !!!! The live streaming was better than I expected. This was amazing. Watching from Derry it felt like we were sitting in the best seat in the house! Wonderful dancing and great commentary. Thank you. Absolutely wonderful! Beautiful costumes and set. Thoroughly enjoyed but let the ballet speak for itself without the interval ‘chat’ revealing of all that is about to happen. Amazing performance, great dancers. Absolutly brilliant first violin in II Act, congratulations! Wonderful harp and oboe as well. From Zaragoza, Spain. Absolutely stunning - Kingdom of Shades Corps de Ballet amazing. Hope it will not be too long until it is included in another season. - Chichester, West Sussex. A true classic ballet of love conquering all in eternity. We are blessed to see these magnificent Principal dancers and the Corps de Ballet were outstanding. LOVE the interval talks and films of rehearsals, so informative. Royal Ballet at its BEST! La Bayadère , ce ballet est merveilleux , c'est un des plus formidable que j' ai vu dans le Cinéma à Dudelange , Luxembourg,je suis Fan de la formule, Royal Opera House, cinéma, les danseuses et danseurs sont exeptionels. Du grand Ballet , merci beaucoup. I had never seen this Ballet before, and absolutely loved it. The sets were superb. The second act for the Corps de Ballet was just spellbinding to watch. My only sadness was that they didn't ALL appear for the encore at the end of the Ballet? To have Nunez and Osipova dance leading roles in the same production was the icing on the cake. Loved the music too! An outstanding performance from all. Thank you. It was without doubt one of the most perfect performance of This Wonderful Ballet La Bayadere. The Corps De Ballet are simply world class.They are a jewel in the crown of our Royal Ballet. I have been watching them since 1968 so it is 50 years of Ballet going. It is so wonderful to attend live screenings,as ticket prices at The ROH are simply no longer affordable,together with exorbitant train fares,our trips to London are no longer possible. Nunez,Osipova and Muntagirov were outstanding. The company are at their zenith at this present time. I do wish that they would tour to the provinces at some point.It would be lovely. I so agree with you about touring the provinces, even if they sent out the up and coming dancers, would love to see Marianela and Vadim on other stages, thought think that would be too much to hope for, would give other dancers more stage time, I remember the days when the RB used to come to the Grand Opera House in Belfast. I'd even be happy if they sent out the costumes, now, that would be something to see some of their historic costumes up close. Watched la bayadere from Basel/switzerland and enjoyed it very much. Beautiful choreography, dancers, Music especially I liked the 2nd Act with the shades, Perfect! My husband and I were at the Vue Cinema in Paignton and you could feel the buzz from the young members of the audience before curtain up. Then you couldn't hear a pin drop. Spellbinding performances all round. First saw this production first time round when Darcey danced Gamzatti, referred to in the commentary, which I always love. That really was something quite magical. Would definitely buy a DVD of this performance. Thank you for your feedback on yesterday evening's live relay of La Bayadère. There were no issues with the feed leaving the ROH on the night. Therefore, we will follow up with your local cinema to see if anything can be done for future screenings. We have had the same problems with The Darkness with Live relays at Our Local Theatre. I agreed it was very dark in the 1st and 3rd acts. The Broadcast of Swan Lake back in May was a complete disaster. Better luck next time,you should complain and get a refund. I too thought this was a magical evening but I would echo the comment about the darkness of the set particularly in the last act. There are other comments on this on a well know ballet web sight so I do not feel it was my cinema (Odeon Taunton) . We have had a problem with this cinema before but last night the transmission seemed perfect, not even any 'blips' in the sound. Screening at Cineworld world Stevenage totally spoilt because, likewise, so dark. there are no words the ballet said it all! Why have I not heard of this ballet? This is the best production I have ever seen. I have never heard of the composer either. Why? The choreography perfectly matched the music or was it the other way round. Utterly brilliant. What have you been missing ?It has been around since 1877. The Kirov bought act 2 to London in 1961. Nureyev gave The Royal Ballet Act 2 in the 60s. Saw it in Lisbon last evening. 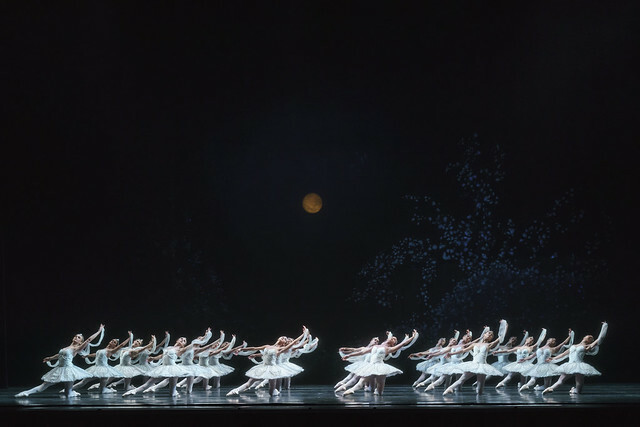 Incredibly beautiful production staged by former “prima ballerina” Natalia Makarova, who was once one of the best performers of “Giselle”, according to my “Dictionnaire de la danse” (ed. Larousse). It was also great to see her interview (and all the others) during the interval. Three top soloists and one of the best “corps de ballet” I had ever seen in one of the most demanding scenes of all classical ballets: the “Kingdom of Shades” scene. I had never seen La Bayadere but thought the performances were wonderful . The live broadcasts from the Royal Opera House are absolutely amazing and whoever thought of it is a genius. Long may they continue. Congratulations to everyone involved. Normally watch on Luçon, France, but last night from Seville. A fabulous evening of entertainment in an almost full cinema with a lot of young people and lots of men in the audience too. Good snacks and Cava put on by the management at the interval. Excellent all round. Great orchestra. So sad I will not be able to participate in other performances when I am in Orlando, Florida in Jan and Feb. Why have you abandoned Orlando? Any reason why it was not shown in Newcastle Upon Tyne? I didn't check the listings, as the Gate always does the live stream, so turned up, only to be told it was not being shown with no explanation why. "Bayadere" is one of my favourite ballets, especially with such a stellar cast, so I was devasted not to see it. Any chance of a dvd being made? I have one but it is from several years ago. I watched La Bayadere in The Omniplex Cinema Near Belfast and it was wonderful. I have the DVD and never tire of watching it. I look forwRd to more live steaming in cinemas. I enjoyed La Bayadere so much and had never seen this classic before. The Corps were wonderful no less. I was so impressed with the soft landing of all the RBC dancers and ballerinas in all the allegro work. Congrats all round! I loved every minute of this amazing ballet! Marianela Nuñez and Vadim Muntagirov were incredible as were Natalia Osipova and Gary Avis. As for the corps in the Kingdom of the Shades, they were spectacular! I really think the RB corps is the best in the world! Congratulations to the entire cast! Where was it shown please? Enjoyed the evening with my wife who hasn't seen this ballet before. One minor criticism - on the Kingdom of the Shades , 32 Shades would have been much more spectacular than 24. This was my first visit to a live screening of ballet and my friend’s first live screening ever (and she’s a new grandma!) Had a wonderful evening thanks. The ‘live’ness of it all was amazing although the audience in Broughton Park on the border of Wales and England was very tentative in its applause. Do people applaud in other cinemas? This is The Royal Ballet at their best for many many decades! Mr O'Hare has turned the RB in probably THE best ballet company in the world right now. The Corps de ballet is world class and their many outstanding Principals from Nunez and Osipova to Naghdi and Takada, Bonelli, Ball and Muntagirov (as well as some pretty amazing soloists) makes this THE ballet company to watch! Re Olivia's reply to Anna .. no issues with the feed, maybe, but the stage lighting itself was clearly below par. Too dark for much of the time and dancers kept disappearing. This was also true to a degree when I saw the production live in the ROH, but was worse as seen filmed. The temple destruction scene was totally lost, apart from the wandering candles. Not good enough I'm afraid - disrespectful to the wonderful dancers and to the audience. Incredible performance from Vadim & Marianela, Christopher & Alexander - we were a little concerned what time he would get to bed after removing ALL his gold plating!! Wonderful to see Natalia Makarova still at work. Thank you to the soloists in the ROH Orchestra, espec violinist during The Shades. Only query was Natalia Osipova's feet. Her pointe shoes looked so very soft & worn. Perhaps a reason to sign up to the Pointe Shoes Appeal. Thanks to all who contributed towards a very fine ROH performance. An incredible evening. The whole ballet and presentation was simple marvellous! Congratulations from sheringham Norfolk!! We took it all in at the wonderful Kinema in the Woods, in Woodhall Spa, Lincolnshire. My first live screening, really enjoyed it and we’ll be looking at future showings for definite. It’s the first time I’ve seen La Bayadère and we both thought it was magnificent! ROH, will there be a repeat recorded cinema viewing available at a future date? I sure hope so! There were no locations close to my city, so we couldn’t view it live on 13 Nov. Principals, set., costumes all superb and 90 per cent of the corps de ballet. What a pity some were just slightly out of sync from time to time, arms and head movements astray. Sunday encore in Oxford and it's superb. Saw this last week with principal dancer's role reversal and if possible this might be better. Great to see all the wondeful detail. I have just watched it at Picturehouse, Oxford. As always, Marianella was just soooooo perfect. As she was Nikia, who is actually very perfect when she was alive and afterwards she was also a ghost the most of the time, she acted that part out so stunningly! That said, I must say that with this particular production, I can finally understand Gamzetti with rational characterization. That’s thanks to Osipova, whose dance I saw for the first time! But her loneliness because of Solor’s reaction, and very reasonable anger towards Nikia were so expressive, and it actually brought tears to my eyes. I also think, as Darcy pointed out, that maybe the leading two dancers can switch their roles and still Macarova can make an amazing production, because they are such wonderful actresses as well as being so technologically astounding! Finally being Japanese myself, I noticed a pretty soloist with beautiful arabesques, and that must be Akane Takada. It was such a joy to see her dance. This wonderful heritage piece is surely one of the jewels in the crown of the Royal Ballet's repertoire. Let us hope that Yolanda Sonnabend's fabulous sets and costumes, together with Natalia Markova's incredible choreography and characterisation, are handed down safely to the next generation of Royal Ballet dancers and audiences. British ballet would be sadly diminished, for so many reasons, if this beautiful piece were to be dropped or changed. The performance was simply stunning! I last saw this in 1989 at its first airing at the ROH when Darcy Bussell danced on of the principal roles and on this occasion she introduced it! The cinema is a great way to be able to see ballet and opera now I’ve retired to the country. So much so my granddaughter and I enjoyed the opening night of the Nutcracker earlier this week. Occasionally dancers fall or slip over, due to the nature of live performance. It is of course unfortunate but no one gets in trouble, and we have a team of health care professionals ready and waiting to help should they sustain an injury. Loved it! Question: the portrait onstage in act 1, scene 2... who was it supposed to represent? Wish so much I could have seen this screening but none near enough to Middleton, Manchester. Better luck for future ballets in 2019. Your Reaction: What did you think of Wagner's Die Walküre live in cinemas? 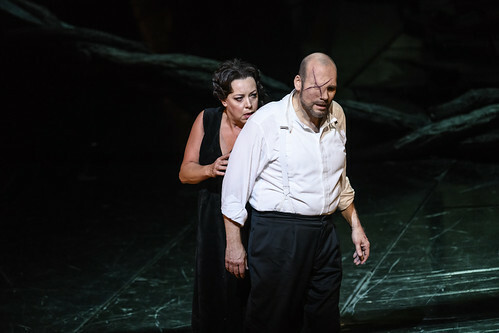 The Royal Opera's staging of the second part of The Ring Cycle was relayed to cinemas around the world.